Discussion in 'NETGEAR AC Wireless' started by kamoj, Feb 16, 2019. 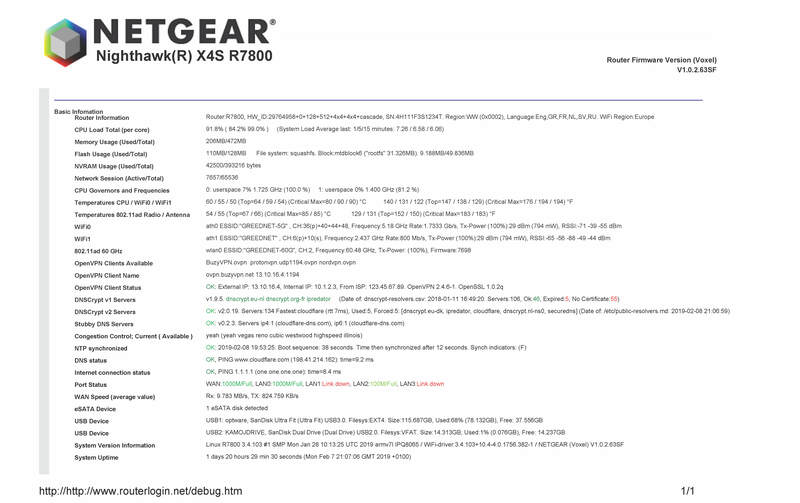 This add-on can be used with Netgear stock firmware or Voxel Firmware. The add-on adds functionality such as Bypassing OpenVPN Client tunnel. This is an update of an existing add-on (See Release Note below for information). More information and functions are added. Change the "Device Name" to include the string "NOVPN"
Now the router will reinitiate itself: "Please wait a moment"
Usage: Reserve DHCP addresses, and add the string "NOVPN" in the "Device Name"
Several devices can be reserved and excluded from OpenVPN this way before doing "Apply". Device Name : Add a Name containing the string "NOVPN", e.g. +Apply : Now the router will reinitiate itself: "Please wait a moment"
- nvram set NO_VPN_LST_ALWAYS="192.168.1.201 192.168.1.202"
Fast time synchronization even when the (e.g. Netgear) NTP server is not working. Show all devices in "Attached Devices" and "Access Control" - even when idle/sleeping. Supervision of the WAN connection, and make Power LED amber if no connection. To Voxel for all help and support he's given to many people during long time. He is a true professional, higly intelligent, kind, humble and supportive person. Previously installed version doesn't need to be uninstalled. Installation of this version will upgrade to latest version. Added "OK" for working DNSCrypt v2 Servers and Stubby. Added "OK" for NTP synchronized. Stain, Gitsum, Tom_Batty and 14 others like this. Highly recommended. kamoj well done. Tom Brough, kamoj and L&LD like this. Fantastic! Will try soon. Thank you very, very much!! Great add-on. A must-have for r7800 and r9000 owners. Ok have just tried this and the bypassing of VPN works, however my internet stops working after 5-10 mins. I have to reset etc to get it back up and running. I remember this happened to me last time and I ended up removing the add-on. @kamoj i noticed you have all three dns servers enabled. DNSCrypt v1 and v2 and stubby. Is this a recommended setup ? I only enabled DNSCrypt v2 and i believe is enough. You are not very informative, I/we need more information. What does the debug page show when "internet stops working"? What does Netgear Genie home page show when "internet stops working"? Are you behind another router? Are you in Router/AP/Bridge mode? What are your devices? Running WiFi or cable connection? This is my first add-on with VPN bypass, so that is probably not what's wrong. If you care to help and find out you should disable the different add-on until it works ok. I really hope you can do this for me and the whole community. Please. The picture is edited to show all possible combinations. It even mixes R7800 and R9000! You can enable all 3 "dns servers" if you want, but only one will be used, as described in Voxel's documentation. I have had an issue with the addon before so it is probably something on my end, just dont know what. Different addons? What other addons are there? I have only installed this. Thank you for attaching the picture, that helps a lot! You have a DNSCrypt2 problem. See if internet keeps working if you don't load the debug page after reboot. Enter your VPN-providers DNS-address(es) in the routers normal DNS settings. I dont usually check debug page all the time. So have already tried this, by not checking. Not sure how to install this fix? Linux/Unix is not my strength lol. Also tried this and this has not worked. Have tried this in the past to no avail. Which addon-on behaviours can i disable ? I have attached an image of the debug page with DNSCrypt disabled. If it is working, enable the functions one at a time and find out when it stops working again. How is the signal coming from your ISP come to your R9000? Is there a modem or router or switch etc between the ISP line and your R9000 router? Signal is fine and I don't have a problem with the internet,speeds or VPN. It's only when I use the add-on my router doesn't like something. In answer to your original question, the router is connected to my ISPs modem.